Studio: Eagle Rock Entertainment Ltd.
Styx: The Grand Illusion and Pieces of Eight Live is an eye-popping DVD of the concert of all Styx concerts for the discerning fan. For those of us who were teens in the seventies, this DVD will bring back many, many very fond memories as the band performs both albums in their entirety. Performed and recorded in the beautiful and historic Orpheum Theater in Memphis, Tennessee, Styx delivers each and every tune from both albums absolutely note perfect. What makes this DVD especially unique is that, reportedly, the band never performed three of the songs live prior to this concert. Personal favorites such as Fooling Yourself, Blue Collar Man and Renegade never sounded better. Hearing them on this DVD instantly transported me back to the late seventies. What a trip! As with other bands from the seventies, the current line-up in Styx isn’t “all original” on this recorded concert but I defy anyone to say that this version isn’t as good as it gets. The musicianship in this line-up is supremely represented in this concert. Dennis DeYoung is replaced Lawrence Gowan and does a dang good job of it, thank you very much. The late J.C. Curulewski is replaced on drums by Todd Sucherman who I at first thought was Journey drummer, Deen Castronovo but I soon figured he wasn’t. But fans will be quite pleased that J.Y. Young, Tommy Shaw, Chuck Panozzo, and Ricky Phillips (formerly with Bad English and The Babys but with Styx for the past nine years) are still cranking out the sticks tunes on this DVD. The albums that this DVD is based on are well known so a review of the songs isn’t necessary here. 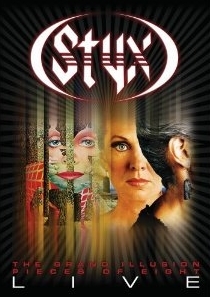 However, as far as concert DVD’s are concerned, you won’t find a more brilliant DVD both in its quality of sound, visual appeal and production quality and is well worth the watch even if one isn’t a Styx fan. If you are a Styx fan, well, you’re going to wear this bad boy out.